Nothing but excitement is what my good friend Paula and I felt about our trip to Davao. It was already a year since the last time that we travelled. And we were just so thrilled together to be back on the road again. We actually made this trip as some sort of our reunion trip. We only had a weekend for this one. And since we already toured around Davao City on our separate visits to this place years ago, we planned to spend our vacation somewhere out of the city. I actually already had a destination in mind when we booked our flight to Davao. I wanted to get to this specific beach that I saw online. I suggested this place to my good friend and without any question she agreed that we could have our weekend getaway there. I know her so well. She can’t resist a gorgeous beach. Always! 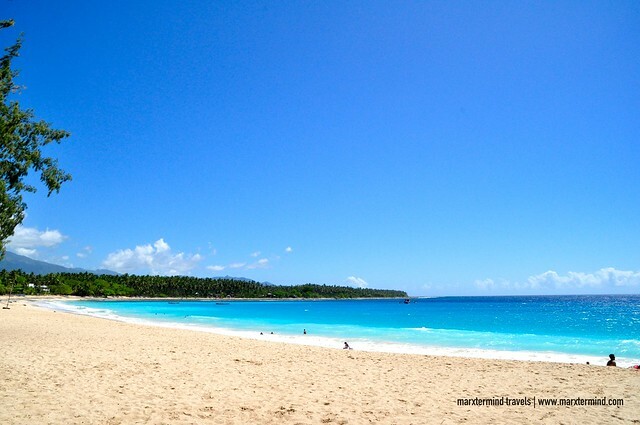 Dahican Beach in Mati was our weekend destination. The first time I learned about this beach, I was already eager to visit it. I just couldn’t find the perfect time. And when we got a chance to book an uber cheap airfare to Davao, I knew that was already the time that I’ve been waiting for to visit Dahican. 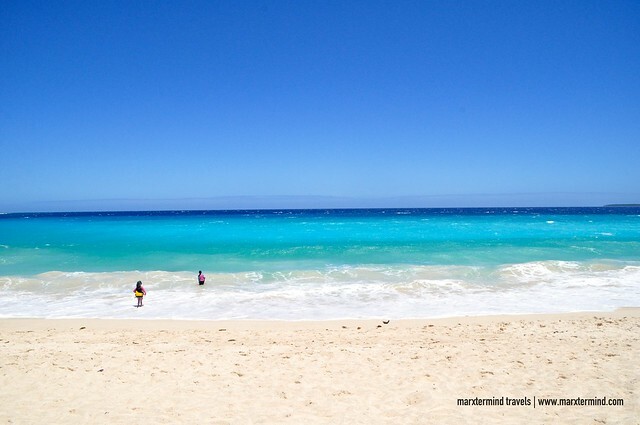 How to go to Dahican Beach? Davao City is the most convenient way to reach Mati if you are coming from Manila or Cebu via plane. From the airport, you can take a cab going to Victoria Plaza Mall Van Terminal, where the public vans to Mati are. But if you’re on a budget like us, you can go to the national highway and take a public jeepney that goes to Victoria Plaza Mall, fare is only PHP 12 per person. Another option is to wait for a bus that passes by the national highway. Buses usually leave every hour from 3:00 AM to 8:00 PM. Travel time from Davao City to Mati usually takes about 3 to 5 hours depending on the traffic condition. Riding a van is considered to be a lot faster compared to buses. So we chose the former. Fare is PHP 220 per person. It was already around 2:00 PM when we arrived in Mati. Upon reaching the city, we hired a tricycle going to our lodging in Dahican. Fare is PHP 150 for both of us. 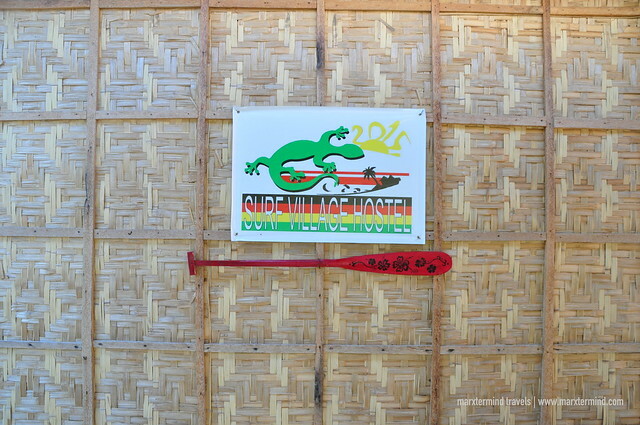 We stayed at Surf Village Hostel in Dahican. 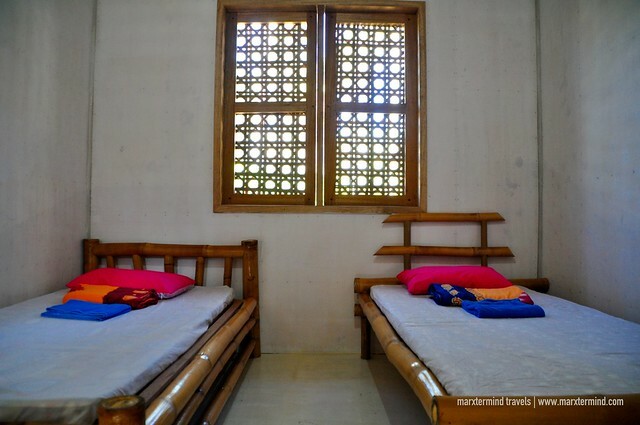 It is a small and friendly hostel located along the highway. It is non-beachfront but the beach can be reached by 5-minute walk from the hostel. The hostel has six separate huts made with native materials. All rooms are fan room. Bathrooms are shared but there are also some rooms with private one. Our room was a standard fan room with twin beds. Rate was PHP 1,000 per night. It came with free breakfast for two. Towels were also provided. It was already late afternoon when we were able to check in to our hostel. We were so exhausted from the long journey, so we decided to doze off first. But that nap took so much longer that it was already 8:00 PM when we were able to wake up. We were so famished. We went out of our room and asked the front desk if we could order something for dinner. Sadly, it was already past cut-off time for food orders. They told us that there’s a restaurant along the highway where we can eat. We went out and braved the poorly lit road hoping that there’s an eatery that we can find. After 10 minutes of walking, we saw a store and asked if where we can have some food. I was already willing to have some canned goods for dinner but the men who were in store were so helpful that they contacted someone to cook food for us. Luckily, they were still accepting orders for food delivery. They arrived at the store in a jiffy and asked for our orders. We ordered some rice and a local dish. While we were in the store, we saw a karaoke machine. We asked how much per song was. We were told it was only PHP 2. It was bargain. So while we waited for our food, we opened the karaoke machine and sang till we dropped. We even stayed at the store after finishing our dinner, till midnight. Well, it was only PHP 2 per song. We just took advantage of the dirt-cheap karaoke that for sure, a rare find in Manila. It was already late morning when got up from our beds. Well, I was feeling so lazy. I guess this was the weekend that I actually wanted after all. We didn’t have any itinerary or list of things to do for our trip in Dahican. But our main purpose was to see the beach. So after taking our breakfast, we went out of our hostel, rode a tricycle and asked the driver to take us to the nearest beach. The driver then brought us to Menzi Beach Park and Campsite. 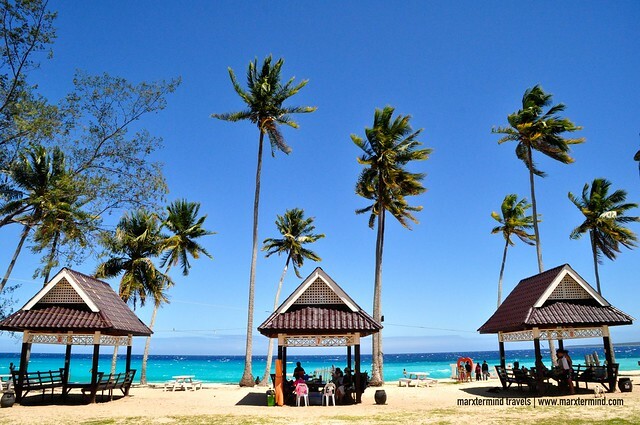 Menzi Beach Park and Campsite is a resort in Dahican that is under the care of the local government unit. Entrance fee is PHP 50 per person. They have cottages good for day tour and overnight. They also have campsites. There are also some tables that guests can use. Toilet and shower area are also available. Paula and I settled in one of the tables first. We observed the people and gazed at the sea for a moment. We were so captivated with the seascape. I was stunned. I instantly fell in love with Dahican Beach. 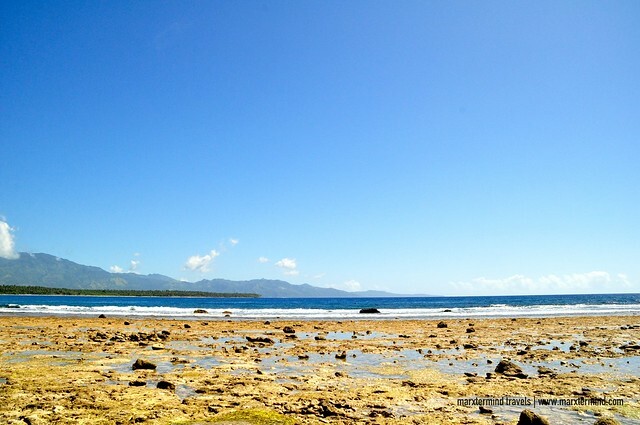 Dahican has a long coastline. It has creamy white sand. The water is clear and aqua blue. The beach is actually famous for water sports like surfing and skim boarding. 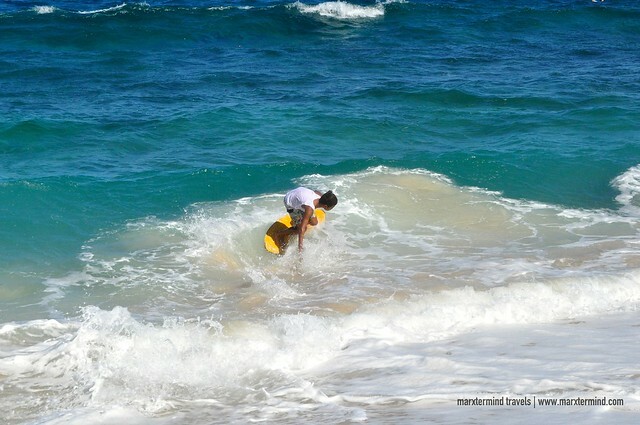 I initially planned to try surfing in Dahican but when we arrived at the beach, my lazy side of me had prevailed. We spent most of the day at the resort. This is where we also had our lunch. 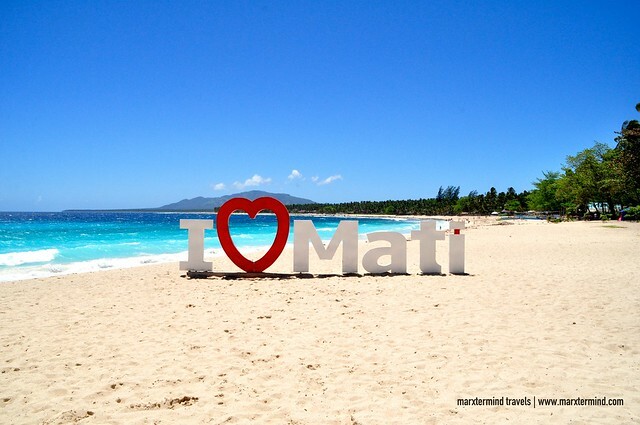 We also found the ‘I Love Mati’ signage. It was already afternoon when Paula and I finally took a swim. The beach was really inviting an it was raging. The waves were furious. 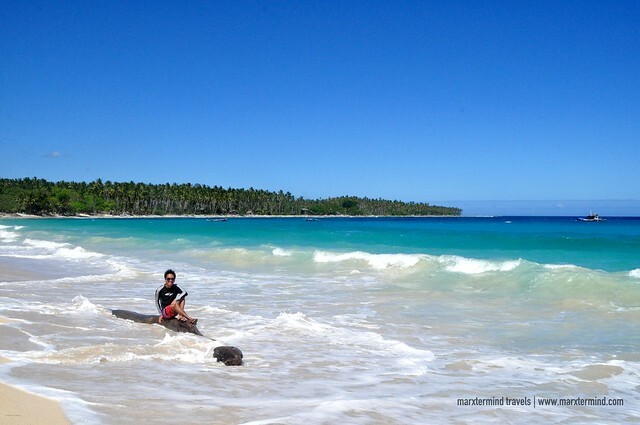 I actually prefer swimming at the calm sea but the wild beach of Dahican was something that changed my mind a bit about my preference for a beach. It was enjoyable playing with the waves. I liked this beach. On our way to Mati, we saw a great overlooking. It was the viewing deck to see the Sleeping Dinosaur. I told Paula that before we go back to Davao City, we have to drop by on that area. She agreed. From the bus terminal in Mati, we rode a bus bound for Davao City. Fare was PHP 20 per person. We told the driver to drop us off at the viewpoint, and he did. 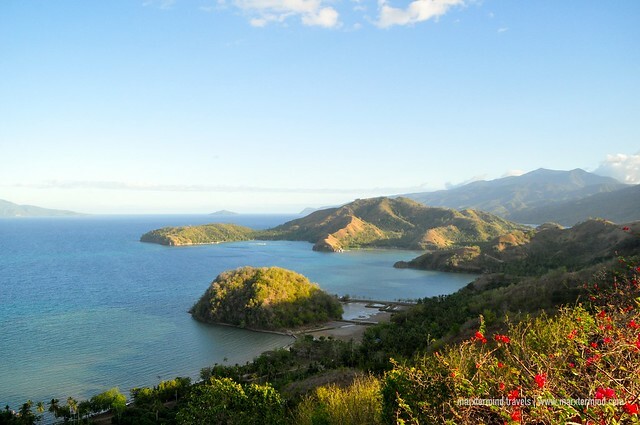 The Sleeping Dinosaur is one of the significant attractions in Mati. Its interesting shape has garnered plenty of myths and tales. The viewing deck can easily be noticed because the area is usually a stopover for most visitors. I would suggest visiting this place first when you’re on your way to Mati. Paula and I spent few minutes taking some pictures. We then left the area when a van bound for Davao City passed by. Dahican Beach was indeed the perfect destination for Paula and I when we had our reunion trip. We only wanted a simple getaway and we were able to achieve that. Although this place is too far from Davao City, the long journey was still worth it. We enjoyed our weekend on this charming beach destination. In fact, I can say that it is now one my favorites in the country. 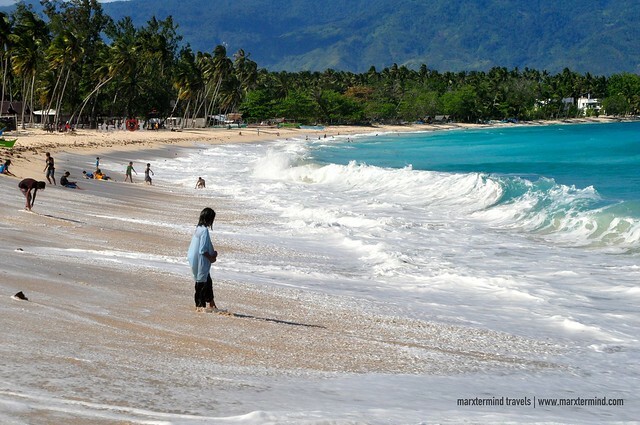 I was just glad that finally I was able to step foot in Mati and see the beauty of Dahican Beach. 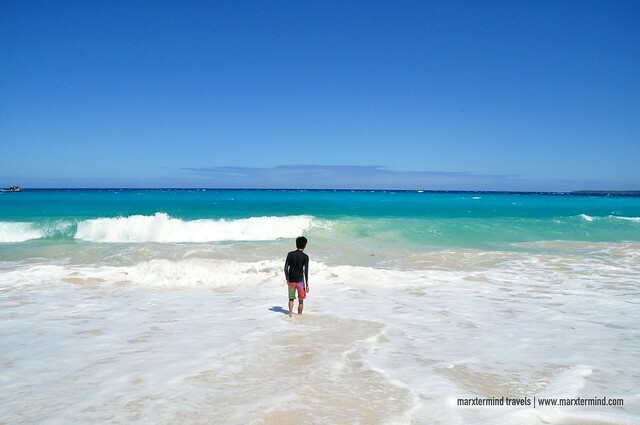 this post expresses how inlove you are in this trip, in this beach? really? i write too. I know how it feels. those words are perfect. “I just couldn’t find the perfect time. I knew that was already the time that I’ve been waiting for..” “I guess this was the weekend that I actually wanted after all.” “I was stunned. I instantly fell in love”. <3 more joyous journeys for you & your very good special friend.